What Are the Different Types of Fondant? If you want to master the art of cake decorating, you'll need to learn a variety of techniques. Whether you're a beginner looking for tutorials on the most basic techniques or if you're an experienced decorating enthusiast who is looking for advanced instruction, you've found a website where you can get exactly what you need. This site is filled with helpful how-to information and tips for cake decorating enthusiasts at all skill levels. When you're just getting started, you need to focus on the basics. You'll find a wealth of resources designed to teach you what you need to know to develop a firm foundation in cake decorating techniques. Frosting: Find out how to make several kinds of icing, including buttercream, sugar-free, and basic fondant. Application: Before you start creating fancy designs, find out the right way to apply frosting to a cake. 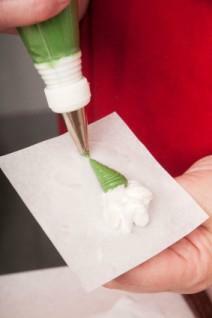 Embellishments: Get used to working with a piping bag with do-it-yourself instructions for royal icing flowers and icing roses. Simple decorating: Start out with easy cupcake ideas like a ladybug design before moving on to a simple cake decorating techniques. Special occasion sweets: Once you start to feel comfortable with what you have practiced, try your hand at decorating a birthday cake. Elegant designs: Find out how to master brush embroidery cake designs to create elegant-looking desserts. Fancy florals: Discover how to make many of the most commonly used flowers for decorating cakes. Gum paste: Learn how to make cherry blossoms or roses out of gum icing to create fancy designs. Forming fondant: Learn how work with fondant, using tools to create cake adornments like letters and people figures. Ultimate skill test: When you're really confident that your skills are advanced, you may want to tackle wedding cake decorating. When you're looking for practical information you can use to enhance your cake decorating abilities, let this site be your go-to resource. You'll always find user-friendly content written and edited by skilled cake decorating hobbyists and professionals. New content is always being added, so check back any time you're ready to master a new skill.